RIO DE JANEIRO, Aug 16 2012 (IPS) - A judicial order to halt construction of the Belo Monte dam in Brazil’s Amazon rainforest may be just one more battle in a long-drawn-out war in the courts over the controversial hydroelectric project. But it leaves a lesson for other infrastructure works: the courts in this country are prepared to uphold the right of indigenous people to be consulted on projects that affect them and their territories. The order to stop work on the Belo Monte dam on the Xingu river in the northern Brazilian state of Pará was unanimously adopted late Monday Aug. 13 by a panel of judges in a regional federal court, and announced the next day. The judges ruled that the construction of what is to be the world’s third-largest dam failed to respect the Brazilian constitution or International Labour Organisation (ILO) Convention 169 Concerning Indigenous and Tribal Peoples, both of which require prior consultation of local indigenous communities. “The Federal Constitution and the ILO Convention state that the national Congress must consult affected traditional peoples before authorising any project for the exploitation of resources on their land,” said Judge Antônio de Souza Prudente, announcing the ruling. “Indigenous people must be listened to and respected,” he stated. Belo Monte is one of the major infrastructure projects planned by the administrations of Brazil’s leftist Workers’ Party, under former president Luiz Inácio Lula da Silva (2003-2011) and his successor, President Dilma Rousseff. The government argues that the dam, which will flood over 500 square kilometres of land, is necessary to meet the country’s growing energy needs. Belo Monte will have a maximum capacity of 11,233 megawatts (MW) during the rainy season, and an average capacity of 4,500 MW. It will supply electricity to some 26 million people, while generating job opportunities. But indigenous villages and traditional communities living along the banks of the Xingu river are opposed to the dam, because although it will not flood their territories, it will divert 80 percent of the water in the river, reducing their water supply and severely affecting the fish stocks that they depend on. For years the communities have held protests against the dam, which increased after work got underway in 2011. The issue has drawn wide international attention. In April 2011, the Inter-American Commission on Human Rights (IACHR) recommended that the Brazilian government immediately suspend work on the dam, and called for “free, prior, informed, in good faith, and culturally appropriate” consultations with the local indigenous communities. But the government rejected the request. “The court decision once again confirms the lack of consent on the part of the local communities and the need for comprehensive environmental impact studies prior to approval of this kind of project, which can cause irreparable damage,” lawyer Joelson Cavalcante with the Inter-American Association for Environmental Defence, which has given the affected communities legal support, told IPS from Mexico. “We welcome this decision because it gives hope that judges in Brazil will enforce national and international laws for the protection of the rights of communities, and the environment,” he added. Dallari, a member of the International Commission of Jurists (ICJ) who has advised other indigenous villages in environmental and land conflicts, noted that prior consultation has been carried out in similar cases, and that this does not necessarily lead to the cancellation of projects. After the talks took place, a projected power line was rerouted so that it would run next to, rather than through, a village, Dallari noted. “Listening to indigenous people does not mean creating obstacles, but making the necessary adjustments,” he said. He also mentioned other cases, such as the construction of roads running through indigenous territories or the Itaipú binational dam on the border with Paraguay, where local communities were not initially consulted either. “The companies in charge of these construction works do not tend to remember that there is a legal obligation to listen to indigenous communities, and want to impose their solutions taking into account only technical and economic aspects, when it is also necessary to listen to (concerns about) human aspects,” he said. With respect to Belo Monte, the court ruled that construction could only resume once the local indigenous people had a say in the matter before Congress. It is not clear whether the project would be definitively cancelled if the communities continue to oppose it. Dallari believes that will depend on the arguments raised. But he said he was confident that, as on previous occasions, an agreement satisfactory to all sides would be reached. The affected communities say the government overestimates the importance of Belo Monte in terms of the electricity it would supply, and defend clean energy sources, such as solar or wind, which would not modify the life of rainforest communities. As a result of the Belo Monte dam, the Volta Grande (Big Bend) of the Xingu river, a 100-km sweeping curve in the river, would suffer from even more severe drought in the summer, because most of the water along that stretch would be diverted by the dam. 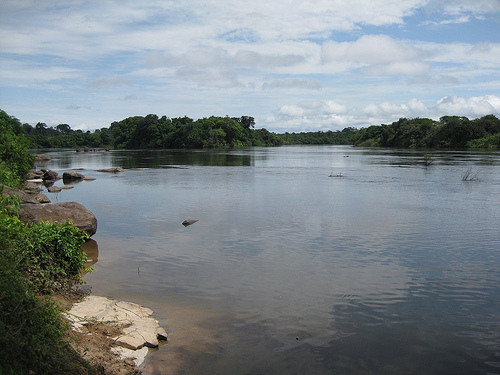 The river is the main source of protein and means of transport for some 200 indigenous people who live along the Volta Grande in the Paquiçamba and Arara reserves, and of hundreds of peasant families who also inhabit that part of the riverbank. Antônia Melo, the head of the Xingu Forever Alive Movement, fears that the indigenous lands, which are “very well-preserved,” will be damaged. The court also fined Norte Energia – the consortium building the dam – 250,000 dollars a day if it fails to comply. As of Wednesday, the consortium had not acknowledged the ruling, which can be appealed. The first turbine of the Belo Monte dam is set to begin operating in 2015, and the entire 13-billion-dollar project is to be completed in 2019. Dams are the most stupid and contemptible thing on the face of the earth. It is unbelivable that in the 21th century people still get energy by destroying so primitively the face of the planet. Nuclear plants are much better for the environment (of course, if they are not built in the range of tsunamies). We should base on them and on saving energy untill a realy acceptable way to capture the huge energy that sorounds us is implemented. There should be an international law which forbids any new dam. I agree there are better means of heating water for electricity, but have to strongly disagree on nuclear. better to dig a hole and boil the water using magma. better yet use politicians hot air speeches. We can not AFFORD to be confused about this” BELO MONTE IS A MONEYMAKING VENTURE. WE will win only if WE ARE DETERMINED. We need to be determined. To not let them win. SO PLEASE DO NOT STOP FIGHTING. there is one and only one name to justify such carnage: socio-economic usury by the black triangle powers. gez when are these butchers gonna halt the wrongly called economic take over?